Scientific Name(s): Distichlis spicata (L.) Greene and Puccinellia nuttalliana (Schult.) Hitchc. 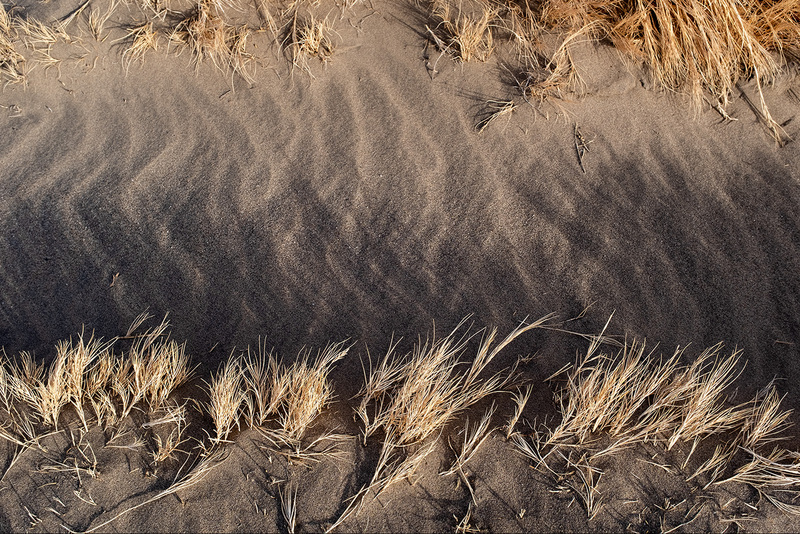 Halophytes, or salt-tolerant plants, are found in a number of environments: seashores, mangrove swamps, salt marshes & swamps, and, as in today’s photographs, saline semi-deserts. Two halophytic grasses, saltgrass (Distichlis spicata) and alkali-grass (Puccinellia nuttalliana), make an appearance in the images. The top image primarily features saltgrass with perhaps some alkali-grass in the upper right corner. The swath of finer-textured taller grasses in the second image is comprised of alkali-grass, while the coarser-textured salt-grass occurs along the edge of the swath and is dotted among the salt-encrusted soil. Despite concerted effort to develop salt-tolerant cereal crops, few commercially viable salt-tolerant crops have been released. This is puzzling, given the number of naturally salt-tolerant grass species. To better understand why salt-tolerance occurs naturally but is difficult to breed into crop species, we take a novel, biodiversity-based approach to its study, examining the evolutionary lability of salt-tolerance across the grass family. We analyse the phylogenetic distribution of naturally salt-tolerant species on a phylogeny of 2684 grasses, and find that salt-tolerance has evolved over 70 times, in a wide range of grass lineages. These results are confirmed by repeating the analysis at genus level on a phylogeny of over 800 grass genera. While salt-tolerance evolves surprisingly often, we find that its evolution does not often give rise to a large clade of salt-tolerant species. These results suggest that salt-tolerance is an evolutionarily labile trait in grasses. As an aside, using the definition from this paper, evolutionary labile traits are those “uncorrelated with phylogeny”…”Such traits may vary more widely than phylogenetically correlated traits among closely related species because they are less constrained by phylogeny.” Or, another way to think about these is that they are not “locked-in” within evolutionary lineages. If salt-tolerance can evolve in a wide variety of lineages, then why is it so difficult to breed salt-tolerant crops? Salt-tolerance has evolved in lineages closely related to crop plants; for example the tribe Triticeae, which includes wheat, barley and rye, contains a number of halophytes such as tall wheatgrass (Thinopyrum spp.). Similarly, rice is closely related to the halophytic wild rice (Porteresia coarctata). One possible reason for the difficulty in breeding salt-tolerant crops is that some crops may have lost genetic variation for high salt-tolerance. For example, recent work has demonstrated that some modern wheats lack sodium transporters that confer salt-tolerance in their wild relatives, and that tolerance can be improved by introducing these into crops. The importance of preserving crop wild relatives–non-domesticated species that are closely-related to food crops–has been advocated for by agronomists and plant breeders for many years. While this was arguably effective within government and other bureaucracies, reaching the general public has perhaps been difficult. As sites of both public engagement and plant conservation, botanical gardens are now also getting involved. For examples, see this upcoming symposium on Celebrating Crop Diversity: Connecting Agriculture, Public Gardens, and Science (through the American Public Gardens Association or this book: North American Crop Wild Relatives, Volume 1. The latter has an open-access chapter on Public Education and Outreach Opportunities for Crop Wild Relatives in North America, co-authored by UBC Botanical Garden’s Dr. Tara Moreau. Perhaps we should be looking at domesticating some halophytes rather than halophyting some domestics. Very beautiful photos, and a very interesting text, even though I only understand about 20% of it ! A fascinating approach where salt-tolerance is bred into (or genetically inserted into) crop lineages. There have been some successes with more salt-tolerant rice varieties. Even a 10% improvement in tolerance opens up large swaths of rice-growing areas and water sources. Still, this is often treating the symptoms and not the disease. The progressive salinization of arid land soils reduces their productivity for native and exotic crops and lowers the species richness locally by limiting the number of species that can cope with the soil ions. I hope for a two-pronged approach to increase crop tolerance AND reduce irrigation and drainage practices that result in solute inflorescences in the upper layers of the soil. Puccinellia ciliata is used in Australia in the reclamation of salinised soils in irrigation areas. The Institute of Sustainable Halophyte Utilization has been working to that end for years now: http://halophyte.org/ I did my Ph.D. from there. Looks like some very interesting work they are doing there. The bands of color and texture in these two photos bring together aesthetic and botanical sophistication, not something seen that often. The information is plenty to chew on, too, thank you Daniel. Lynn, your comments are particularly interesting to me, as these were taken with a 35mm-equivalent lens–which is, I’m told, among the storytelling lenses. 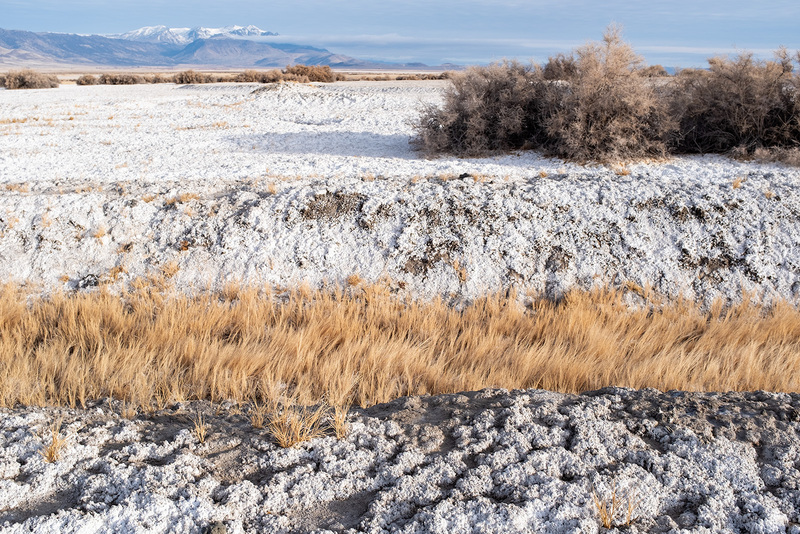 Borax Lake – Alvord Desert – one of my long time favorite places! Thank you for the beautiful photo and informative discussion! I agree with so many of the previous comments – great discussion.